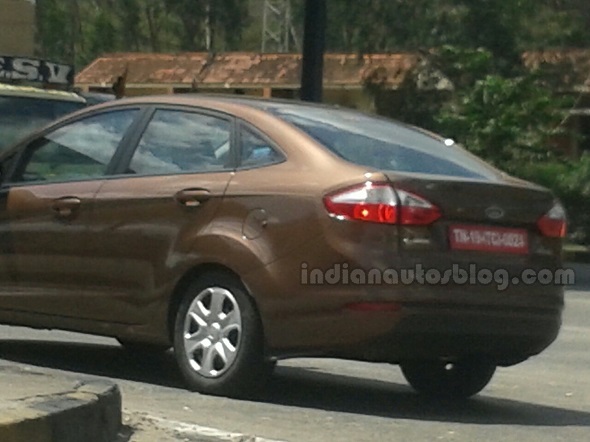 Ford is looking to revive the slow selling Fiesta sedan in India. The American car company showcased the facelifted version of the same at the Auto Expo earlier this year. 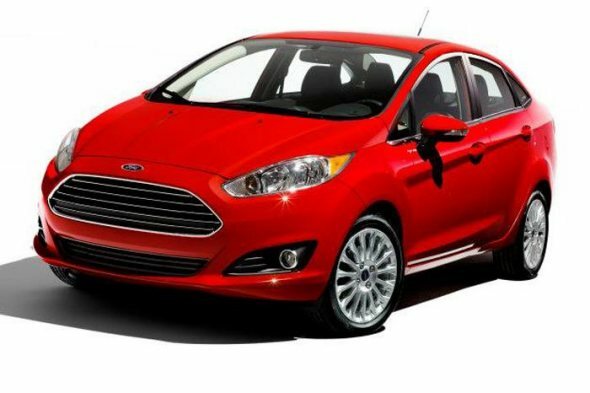 Back then, the car maker stated that facelifted Fiesta’s production will begin later this year. 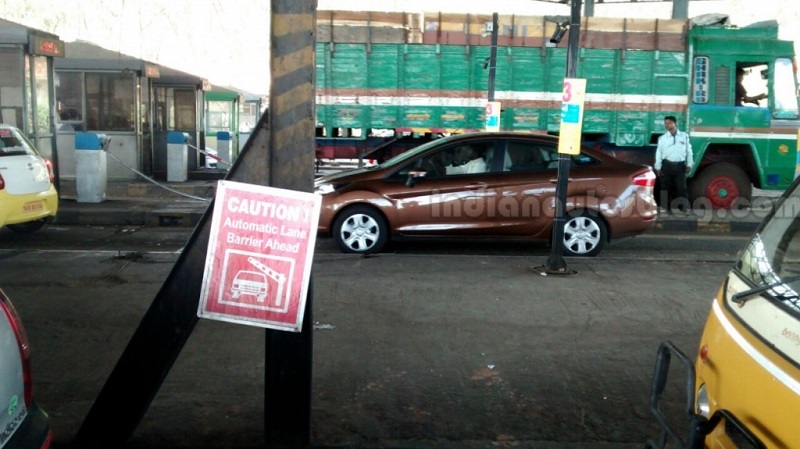 A facelifted version of the Fiesta has just been caught on camera when it was going for a fuel tank refill trip on the outskirts of Chennai. 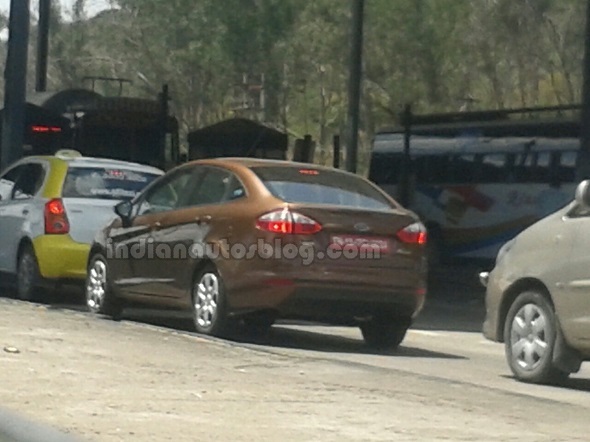 The test mule featured a “Copper Pulse” brown shade, which was showcased on the display car at the Auto Expo. This shade was not available on the pre-facelifted version of the car. The facelifted Fiesta gets an all new front fascia which looks better than the outgoing version. It gets an Aston Martin like front grille which definitely adds lot of character to the car. The headlamps look similar to those of the global Mondeo. The rear tail lights now get elongated and seem better integrated with the boot lid. Coming to the interiors, the facelifted Fiesta gets the company’s much famed SYNC infotainment system, along with the AppLink and Emergency Assist Systems which we first saw on the EcoSport. The headlights and wipers are now automatic. Under the hood, the same engine options of the pre-facelifted model will be retained. The car will feature the 1.5 litre TDCI turbo diesel motor (mated to a 5 speed gearbox) that powers the outgoing Fiesta and joining it will be the 1.5 litre Ti-CVT petrol motor that gets two gearbox options: a 5 speed manual transmission and a 6 speed dual clutch automatic transmission. Ford needs to price the facelifted Fiesta right and not make the same mistake as it did with the pre-facelifted version by pricing it a touch too ambitiously. The company has gained traction with the sales of the EcoSport and if the Fiesta hits the sweet spot in terms of pricing, the car will be a worthy rival to the likes of the City, Verna, Vento, Rapid and Linea.